Project Dinnertime™ – School to Home is an innovative program encompassing Nutrition Australia ACT’s (NA ACT) Project Dinnertime™ theme of getting more people cooking more often. It addresses components of the Australian Curriculum within the Healthy and Physical Education and Technologies learning areas. Project Dinnertime™ – School to Home emphasises practical nutrition learning and is closely aligned with ACT Government goals to reduce obesity and improve nutrition outcomes for young people and their families in the ACT and wider region. Designed in response to requests from school nursing teams and community workers, this innovative resource addresses the current concern that many of our young people carry responsibility for looking after themselves and others in their home environments with limited or no basic nutrition and food preparation skills. The facilitator manual has been designed for use by school based staff within the teaching and student welfare teams. Delivery of the program may include, but is not limited to: counsellors, pastoral care teachers, nurses and aboriginal health workers who may regularly visit the school. The unique flexibility of this food skills tool, allows it to be modified for use in classroom settings or within community and youth centre programs. 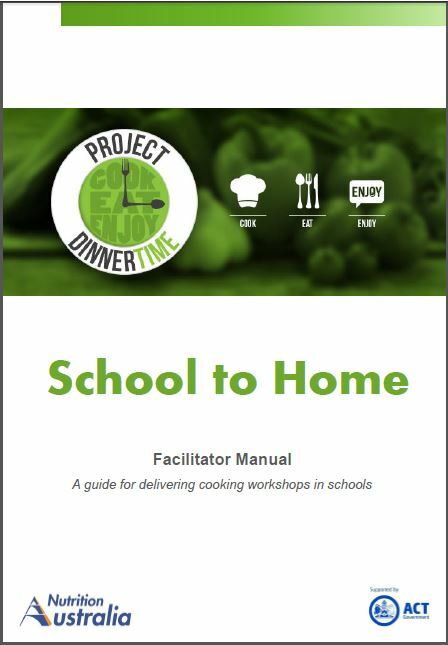 Project Dinnertime™ – School to Home has been developed under the joint Australian, State and Territory Government initiative under the National Partnership Agreement on Preventive Health.